We know that carbon dioxide is a major greenhouse gas — but did you know it’s also a world traveller? 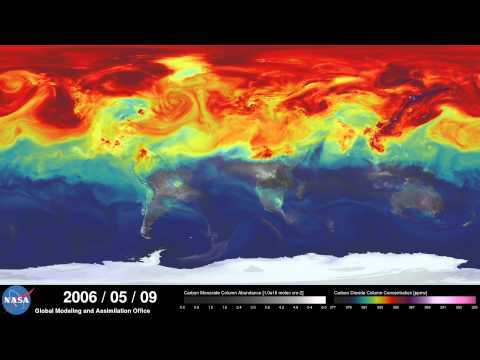 A new video from NASA’s Goddard Space Flight Center shows just how CO2 emissions move across the globe, thanks to an ultra-high-resolution computer model that shows both the concentration and position of the gas in the atmosphere over a calendar year. Driven by weather patterns, the time lapse of data from 2006 shows how CO2 emissions peak in the winter months in the northern hemisphere. As the region moves into spring and summer, photosynthesizing plants help remove some of the gas from the air. Meanwhile, in the global south, carbon monoxide emissions climb as fires in south America, Africa and Australia send masses of the gas into the atmosphere. It all contributes to a very smoky picture of our planet, as emissions flow across the globe and the concentration of gasses obscures entire regions from view. They show clearly how emissions from one country quickly move to affect others — these gasses don’t respect country borders. Neither does climate change.